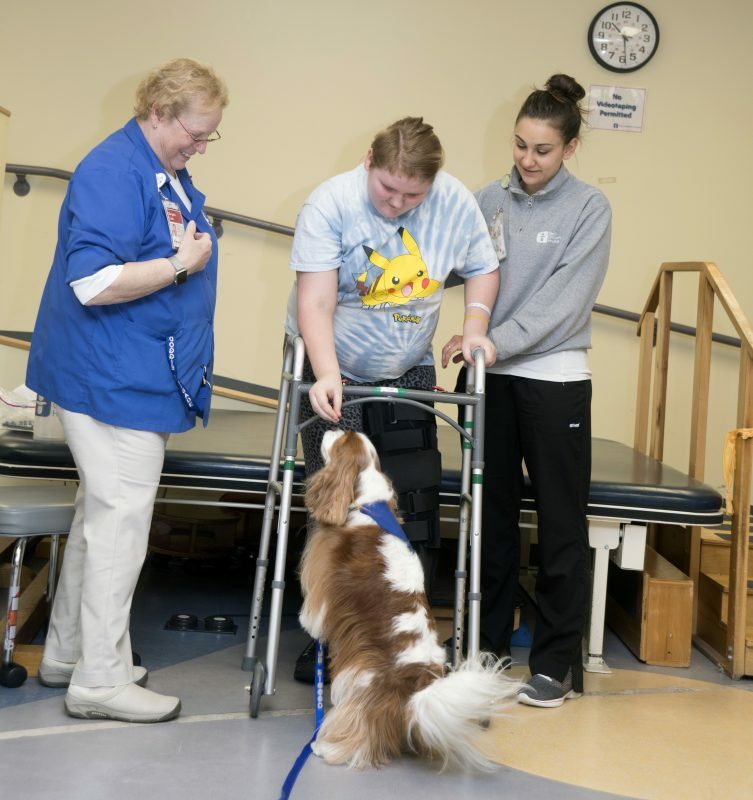 It’s almost National Therapy Animal Day (April 30) with Pet Partners, and we can’t wait to celebrate the amazing impact they have on our patients! 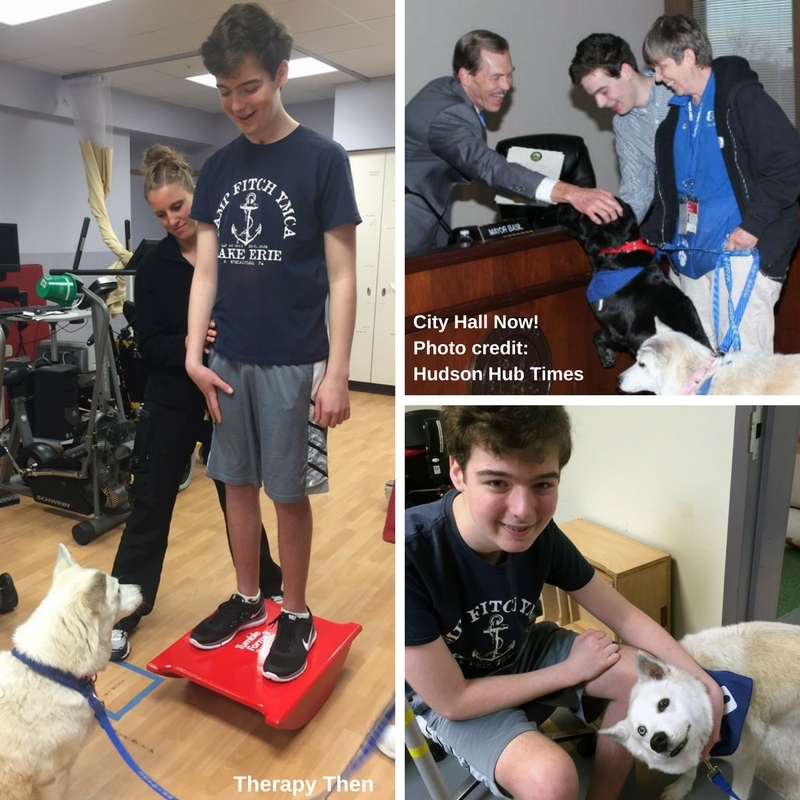 Many research studies show the benefits and value of therapy animals, but Jerry Miller, 12, and Jack Lehman, 16, can personally speak to the comfort and healing they experienced. 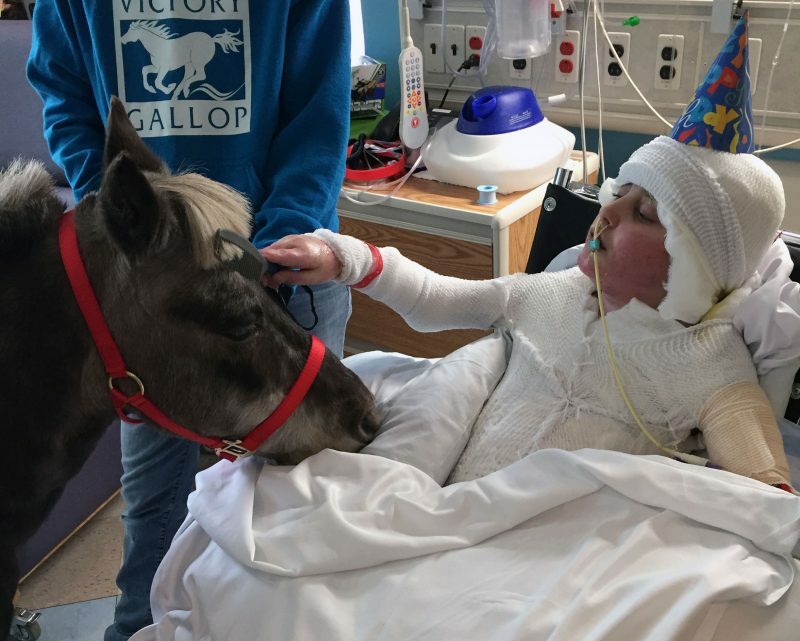 They are 2 of many, many kids who have worked hard along side our Doggie Brigade members and Petie the Pony during physical, occupational and speech therapy. With burns over 85% of 12-year-old Jerry Miller’s body he might not have survived more than 20 surgeries with Dr. John Crow without skin from his twin brother John. It took the whole family and a special friend to help Jerry. They all became great friends with Petie and his handlers Sue Miller and Kim Gustley from after months of therapy together. They even celebrated Petie’s 25th birthday last October in Jerry’s room in the burn center. Shown above, one of Jerry’s occupational therapy session included combing Petie’s mane. We are so excited that soon 6-year-old Khyler Ruiz, of Dundee, will see the benefits of a therapy animal. 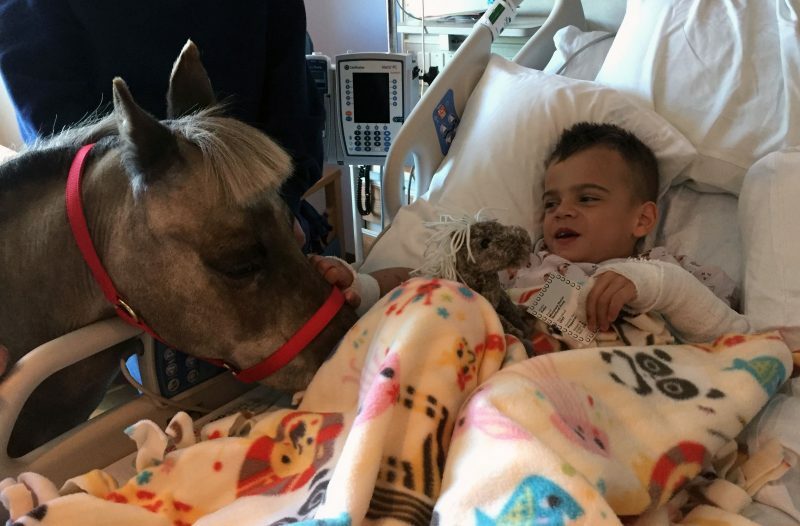 He met and “horsed around a little” with Petie while he was still in bed. They will soon begin occupational therapy together as Khyler recovers from burns suffered during a grease fire. Stay tuned for updates on Khyler’s progress. Margaret Cook and her Cavalier King Charles Spaniel named Izzie are also dedicated to helping patients during therapy sessions. Here they are with 14-year-old Amanda Bidwell of East Liverpool. Izzie joined the Doggie Brigade in 2010; her favorite treat is a cookie. Roxie hangs out in speech therapy while the patients ask questions to her handler Karen. About every 6 weeks, Speech Pathologist Amy Gould invites a Doggie Brigade team to attend group speech therapy as a reward for the kids. She realizes the kids sometime need a boost of fun to keep the enthusiasm for learning strong. 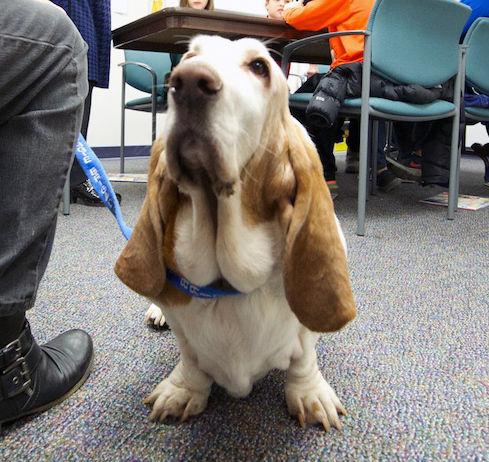 See this story of when Roxie, a red and white Basset Hound, attended: http://bit.ly/2pi4Tsw. Shown above, the kids interview Roxie’s handler, Karen Koslowski-Cahoon, about the 7-year-old canine. Doggie Brigade volunteer Don Weisel of Akron is our most active volunteer in therapy sessions. He has the help of his 4 Labrador Retrievers: Brandie (joined 2006), Dixie (2006), Rosie (2007) and Katie (2012). It’s no surprise that they love what they do but do enjoy dog biscuits, popcorn and pizza crust as an extra reward. Check out this video from 2010 of Don and Chris discussing the role that man’s best friend plays in helping kids recover after injuries and illnesses.